This bundle includes (5) items: "Ducks," "Wildlife," & "Bucks 2" glass etching stencils under brand name Over N' Over and 1 free How to Etch CD-ROM eBook with each purchase. Includes patterns for computer use only. These reusable stencils are great for decorating your painting or etching projects. The package designs consist of the following for each size. Ducks: flying ducks 1 3/4" x 1 3/4", sitting ducks 1 3/4" x 1 1/2". Wildlife: Large Buck: 3.75" x 3", Smaller Buck: 2.6" x 1.75", Small Buck Heads: 1.1" x 1.25", Eagle Head: 1" x 1". Bucks 2: Top Left: 1 1/2" x 2 1/2", Top Right: 2" x 1 3/4", Middle Left: 1 3/4" x 3", Middle Right: 2" x 2 1/2:, Lower Left Heads: 1" x 1 1/2", Lower Right: 2" X 2"
Etch or paint stencils of the great outdoors on nearly anything easily! These adhesive-backed wild life animal & forest themed stencils reduce frustration in having to cut and adhere them. 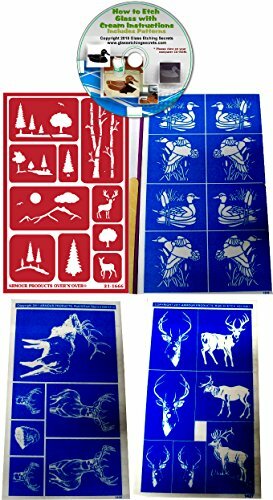 Includes over 30 stencils of deer, elk, eagle, mallard ducks, pine trees, mountains, etc. Includes 1 free how to etch ebook & patterns on CD-ROM with each order. If you have any questions about this product by Armour, contact us by completing and submitting the form below. If you are looking for a specif part number, please include it with your message. Over 'n' Over Reusable Self-Stick Etching Stencil for Glass (or Stamping) - BUNDLE OF THREE BLANKS - Make Your Own Designs! © 2019 - vainsfaktory.com. All Rights Reserved.